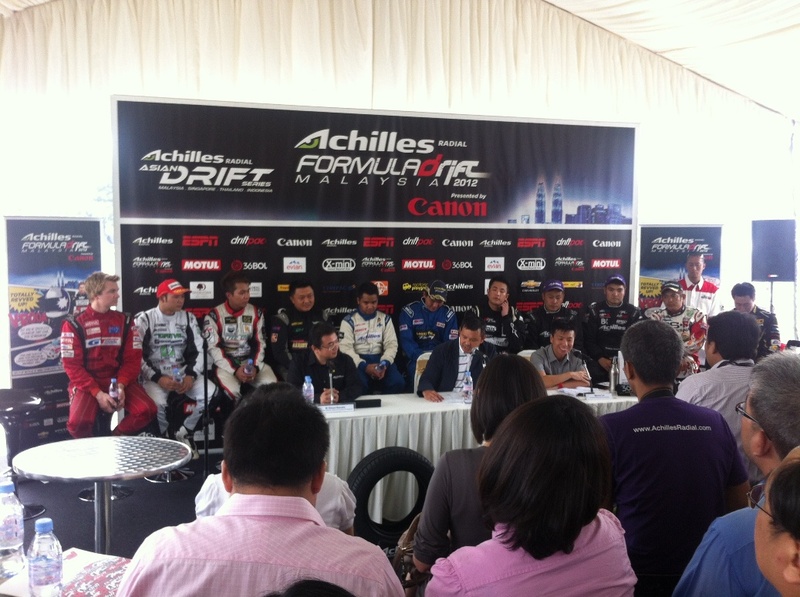 FD Malaysia: Press Conference and Media Ride Day! 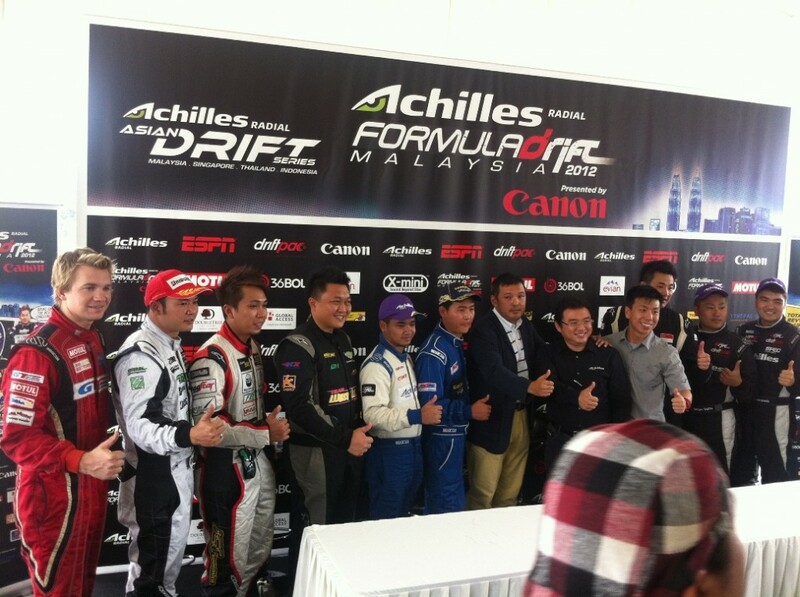 Home » FD Malaysia: Press Conference and Media Ride Day! Today we got up nice and early so we could be at the track with plenty of time to double check the S15 and make sure everything was in order ahead of the media rides. After another great Malaysian breakfast, we made our way to the track. When we arrived, we were not expecting this! 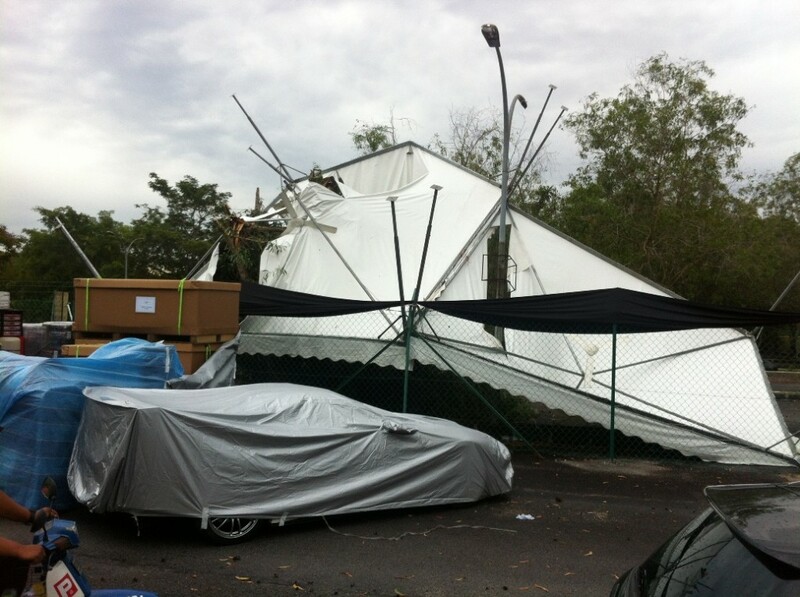 Luckily this was not the tent our car was under, as we don’t have a car cover for the S15. But only 2 tents further up the line, there it was. Looking lke nothing had happened! And once they found it was all ok, they moved everything to a more secure, less torn up tent area. Then we checked over the S15 and took it for a quick drive through the pit area and decided it was ready to go! We parked the S15 amongst quite an amazing line-up including Saito’s 250C (he spent about an hour fitting his smaller sponsor stickers all around the car) and Robbie Nishida’s all new Chaser. Now this is not the old Weds car I thought it was, but a spare JZX100 chassis Saito had that Robbie built up especially for FD Asia! 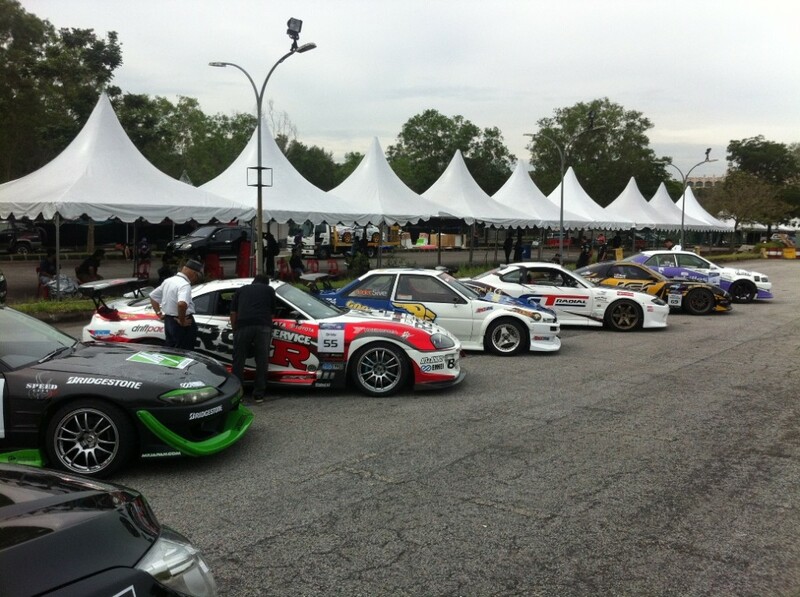 Then we were setup a little more presentably with the other cars that were to take part in the media ride session later. The press coferences at these FD Asia events continue to surprise me with the number of people in attendance and the interest all of the media takes in the whole event! I was asked a quesion again this time… I hope my answer made sense! Afterwards it was time for some photo opportunities, inside and outside. Then it was time to take some media personel for rides! This was not on the full track (which looks very fast!) but just a desgnated section of the track for the media rides. I don’t have pictures of this, but I will hopefully have some sort of footage of this tomorrow some time! 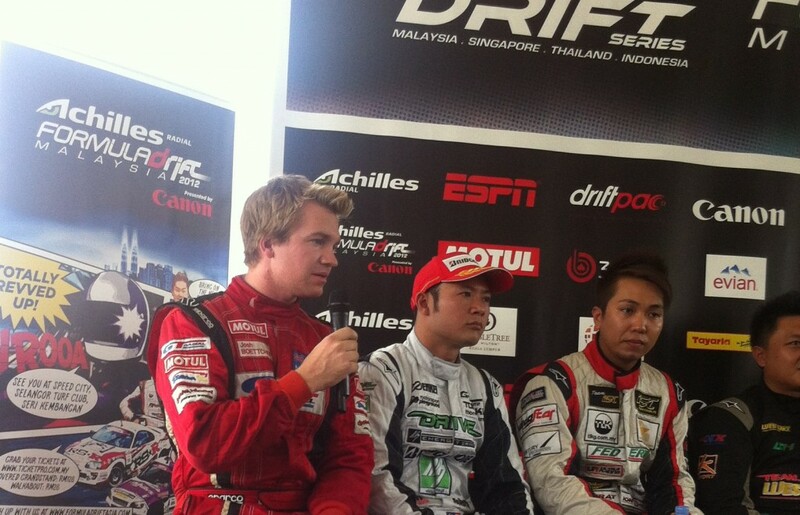 After a hard and hot days drifting, we were quite excited when Duncan from GT Radial Malaysia mentioned that dinner would be at ‘Malaysia’s best Satay!’. 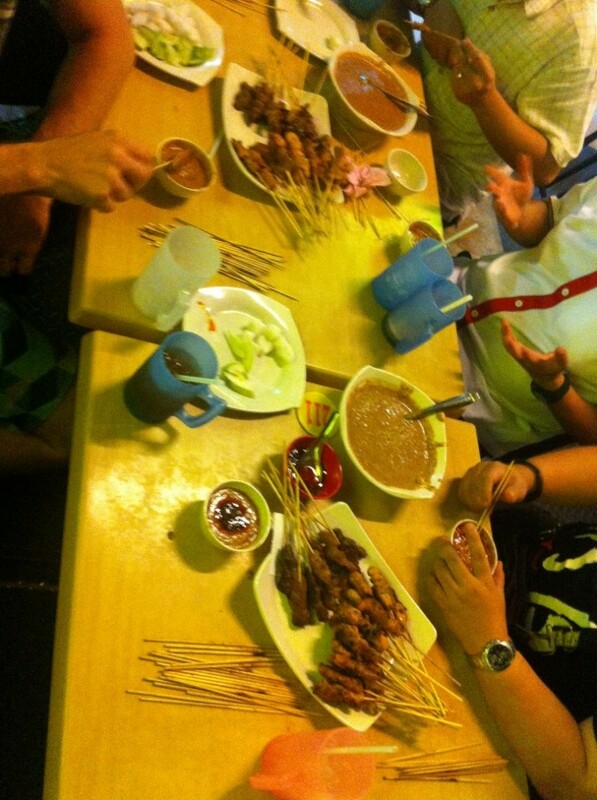 The satay mixed with Malaysia’s obligatory chilli bowl was amazing of course! So tomorrow it’s time to see if the S15 will pass the more strict Formula Drift specifications. So let’s hope I’ve read the rulebook right! I’ll be back tomorrow!! Stay Sideways!